Barcelona is a fantastic city to visit. Markets overflowing with incredible produce, awesome architecture, friendly locals, bountiful sunshine, and of course, some excellent eating establishments. 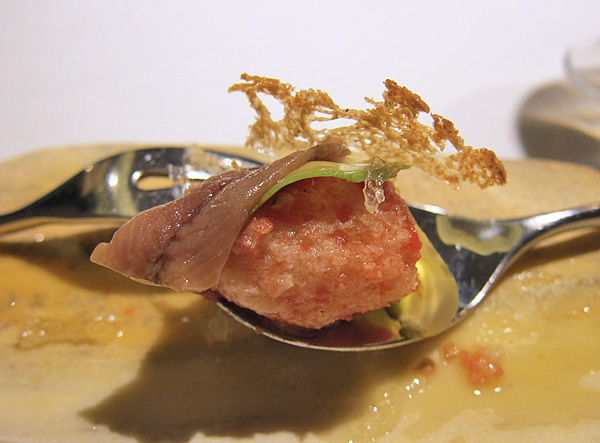 On our most recent jaunt there we ate well at Moments, Rias de Galicia, Tapas 24 and in particular, ABaC, which I feel deserves a special mention here. This was our second time at the restaurant (housed in a sleek boutique hotel of the same name), but the first with chef Jordi Cruz at the helm. 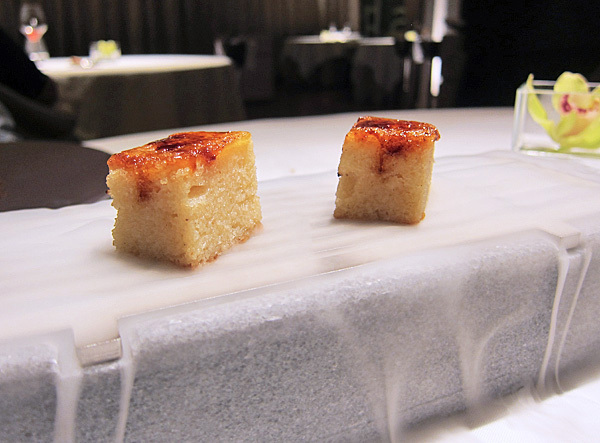 Having previously held a Michelin star at both Estany Clar and L’Angle de Sant Fruitós de Bages, Cruz has impressively managed to attain two coveted stars for ABaC in the short span of two years since he took the reins in 2010. 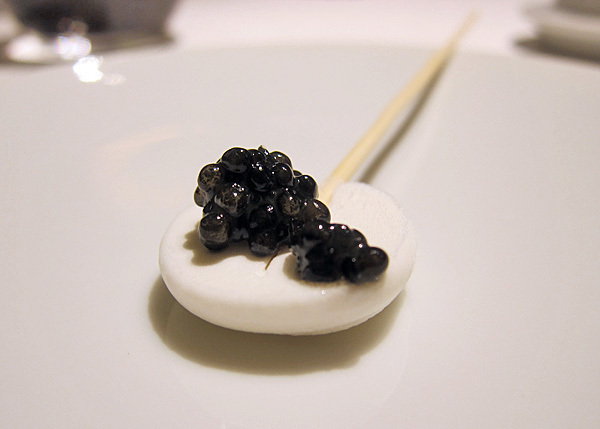 We chose “The ABaC”, one of the two tasting menus on offer (à la carte is also available) which began with amuse-bouches of Melon Mojito (mint sorbet, rum jelly, syrup-soaked melon and lime sugar-dusted sugarcane) and Iranian Caviar topped Frozen Sour Yoghurt Lollipops, made in front of us. Bread with Tomato, Avocado and Anchovies looked sloppy, but was an appetising bite. 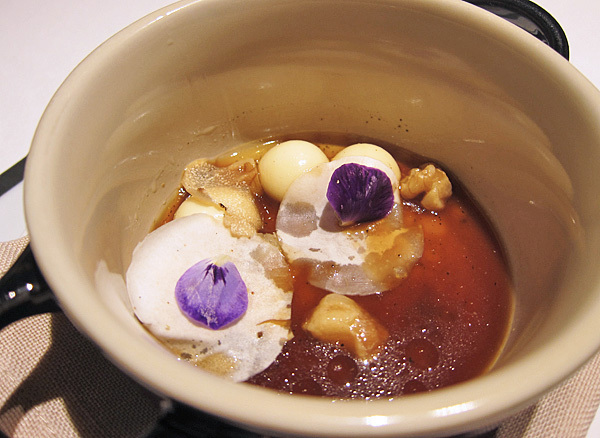 Liquid Parmesan Gnocchi in Bergamot Butter with Nuts, Lemongrass and Truffle Mushroom Infusion blew us away – intense fragrant broth jazzed up with fresh truffle shavings, crunchy walnuts, pretty petals and orbs of “gnocchi” that burst delightfully in the mouth. 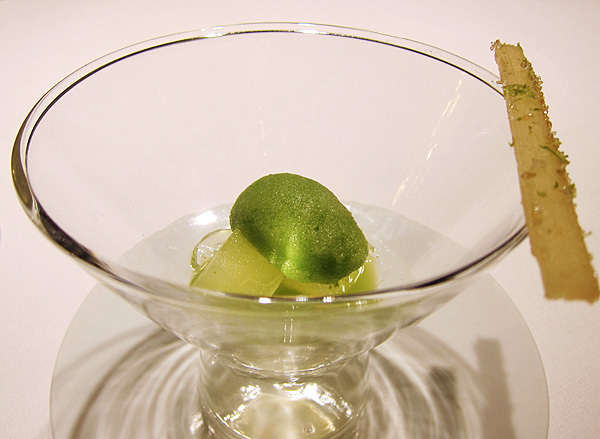 Frozen Fig Leaf Infusion with Foie Gras, Figs and Sweet and Savoury Migas was delicate and well-balanced. 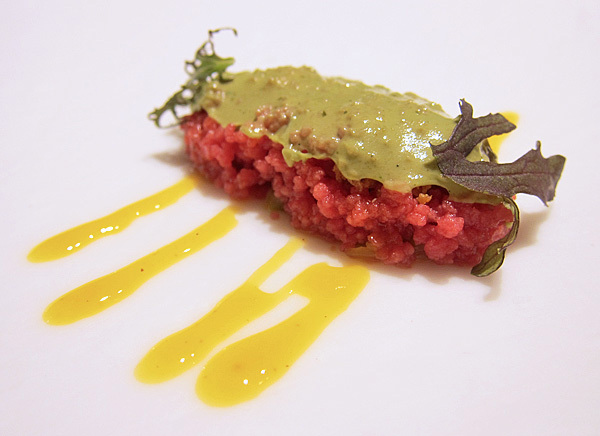 Smoked Steak Tartare with seasoned snow-like beef, cooked egg yolk, veil of mustard and pepper bread brittle was equally delicious. 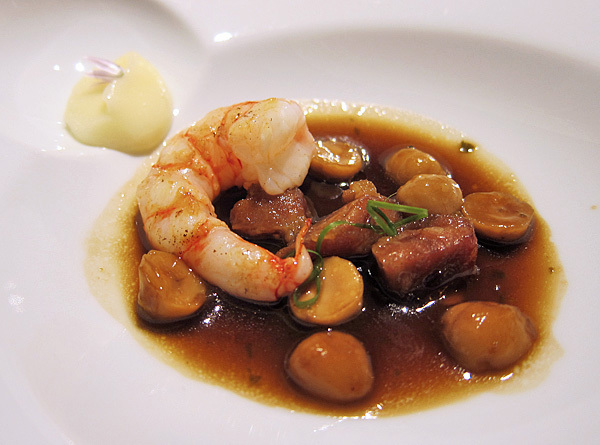 Prawns cooked on a slab of heated salt at the table were beautiful on their own, but sadly overwhelmed by the accompaniments of hazelnuts (cooked to resemble chickpeas in both appearance and texture), Iberian pork nuggets, citron aioli and rich fideua jus. Rice, Farm Chicken, Saint-Félicien Cheese, Nuts, Rocket Flowers and Egg Yolk cooked with Candied Garlic was a flavourful miniature take on paella. 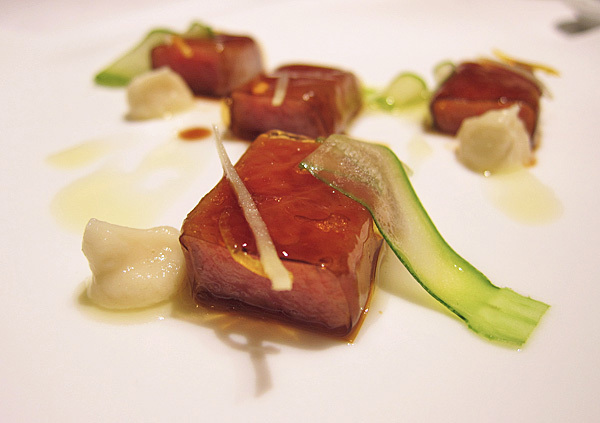 Mediterranean Tuna Belly with Ponzu Sauce, Kumquat Skin, Mizuna, Zucchini with Olive Oil and Spicy Root Purée was great concept-wise but needed tweaking – the thin sheets of ponzu jelly were overly salty and didn’t allow the fish within to shine. 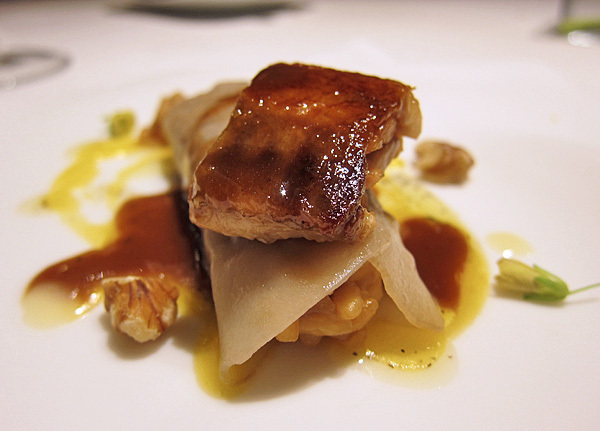 The star of the night was the Kid Goat, slow-cooked in cider at 63°C for 24 hours. 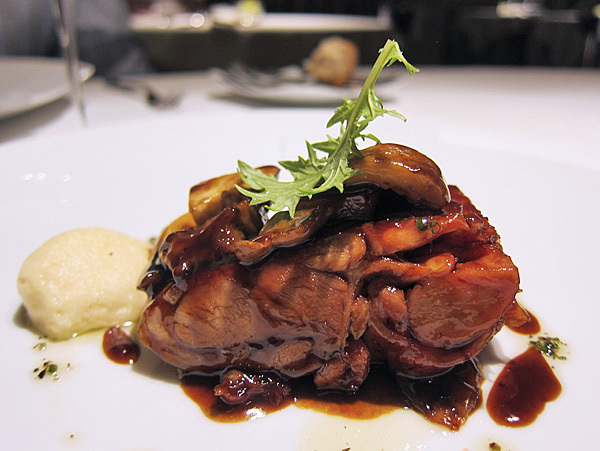 The meat was fall-apart tender and perfectly paired with earthy mushrooms, sweet cider apples and tart apple foam. Exceptional. Desserts were no less accomplished. 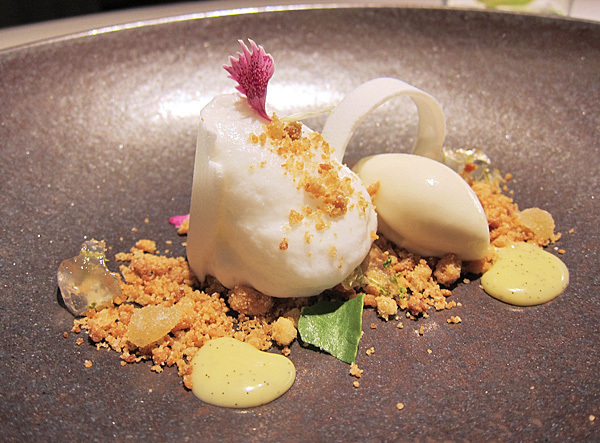 A mélange of Lime, Coconut, Meringue, White Chocolate, Yoghurt and Ginger, was light and refreshing. 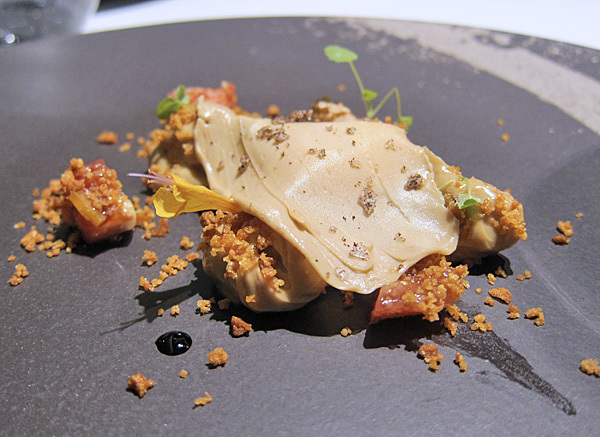 “On a Bed of Smoked Bread Brittle, Roast Biscuit, Banana, Coffee, Vanilla and Bourbon” came in two parts – glazed cubes of sweet bread bathed in a sea of bourbon smoke, and a plate of coffee cookie and biscuit crumbs, caramelised banana, vanilla ice cream, lightly misted with the same bourbon. We both enjoyed this immensely, especially the bread which tasted like rum baba, but with bourbon (obviously). To finish were a platter of petits fours and a couple of extra sweet treats – airy yoghurt granita and “lipsticks” of strawberry ice. 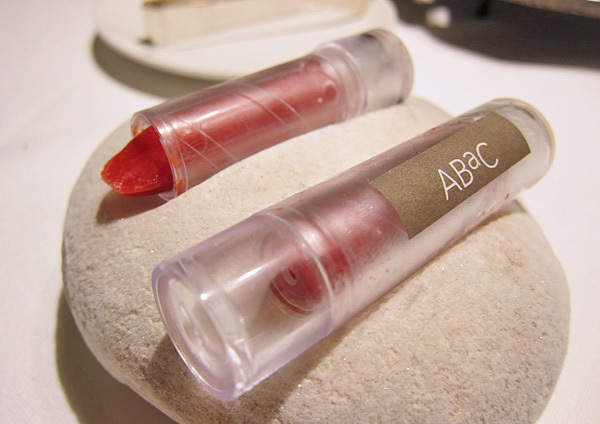 ABaC was a great all-round experience. 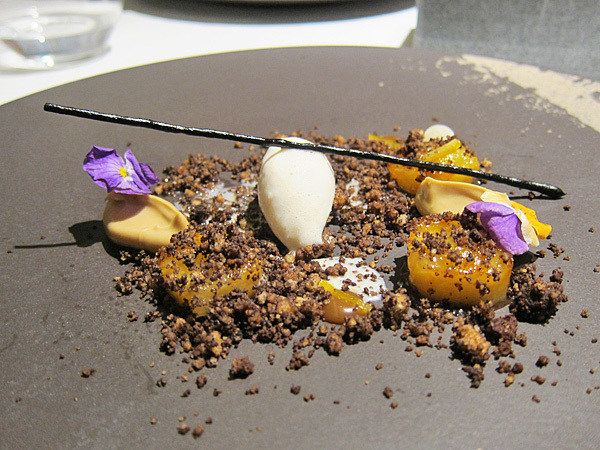 Aside from the playful well-composed dishes, the service was impeccable, and the dining room beautiful. There’s even rooms or a spa to roll off to after your meal should you choose to stay at the hotel. 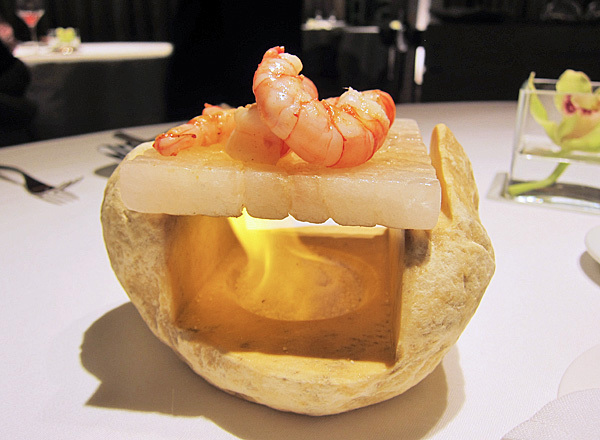 If searching for fine-dining in Barcelona, this place should be at the top of your list. 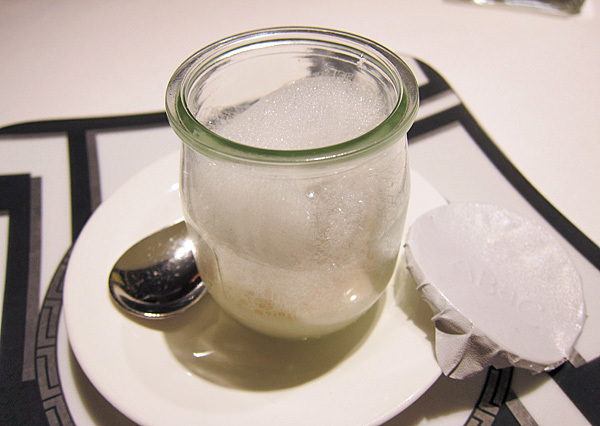 ~ by gourmettraveller on January 17, 2013.